Infinity Pharmaceuticals, Inc. (IPI) is a drug discovery and development company. The Company's lead product is a potent, oral inhibitor of Class I PI3K-delta and PI3K-gamma, which the Company is investigating in both hematologic malignancies and inflammatory diseases.Its retaspimycin hydrochloride (HCl), is a potent and selective inhibitor of heat shock protein 90 (Hsp90). The phosphoinositide-3-kinases (PI3Ks) are key cellular signaling proteins that act as a central node for relaying signals from cell surface receptors to downstream biochemical events. The Company’s lead development candidate in this program is IPI-145 a potent, oral inhibitor of Class I PI3K-delta,gamma for which clinical trials are conducted form both hematologic malignancies and inflammatory diseases. Hematologic malignancies are cancers of the blood or bone marrow and include leukemia and lymphoma, such as chronic lymphocytic leukemia (CLL), Hodgkin lymphoma, and non-Hodgkin lymphoma (NHL). 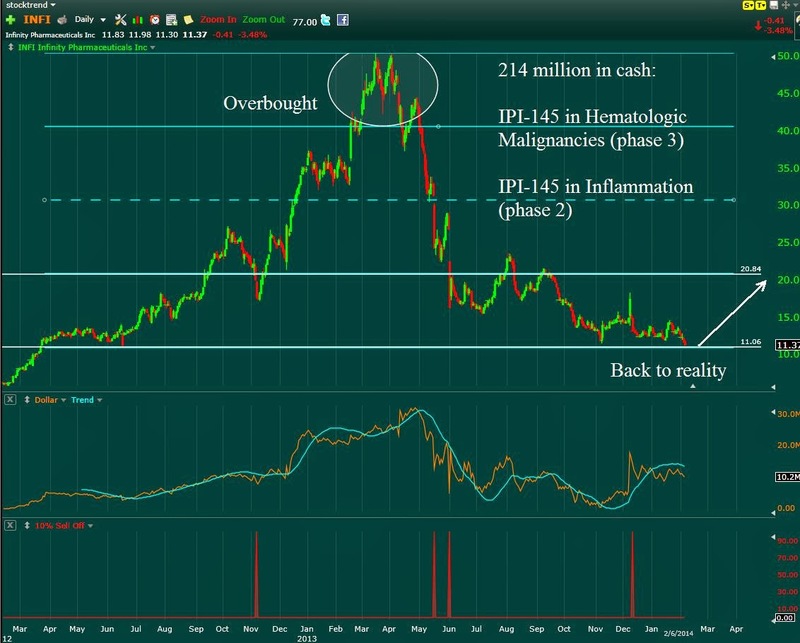 INFI chart buy when its moving, wait for earning to get over. Operating Expenses: Infinity expects operating expenses for 2014 to range from $170 million to $180 million. Net Loss: Infinity expects net loss for 2014 to range from $170 million to $180 million. Cash and Investments: Infinity expects to end 2014 with a year-end cash and investments balance ranging from$40 million to $50 million. Based on its current operating plan and exclusive of any business development activities, Infinity’s financial foundation is expected to provide a cash runway into 2015.